Bar work might seem a bit of a tame occupation for a witch but having worked in The Ship for twenty years, Barbara Harrison isn’t about to turn any of her regulars into toads while they’re having a quiet pint. Her group – they’re not a coven – is called So Moot It Bee and Barbara has been with them for around ten years. So what do white witches do nowadays? 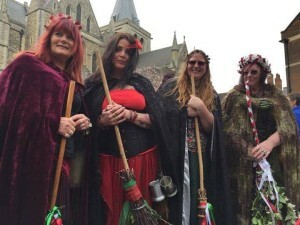 “We’re pagan hedge witches and meet at The Good Intent in Rochester once a month to hear a guest speaker, and for rituals and spells. We deal in herbs and healing – our magic is all positive. The group has grown from 13 to over 40, with yet more joining, and we often take part in events for the Pagan Federation in London. You can see Barbara and some of her group at the Sweeps Festival in this video from ITV Meridian. Festival image courtesy of Barbara. « The ‘Mayor’ of Upnor – official residence, The Ship!